It’s been a few years since I’ve done a New Year’s post. 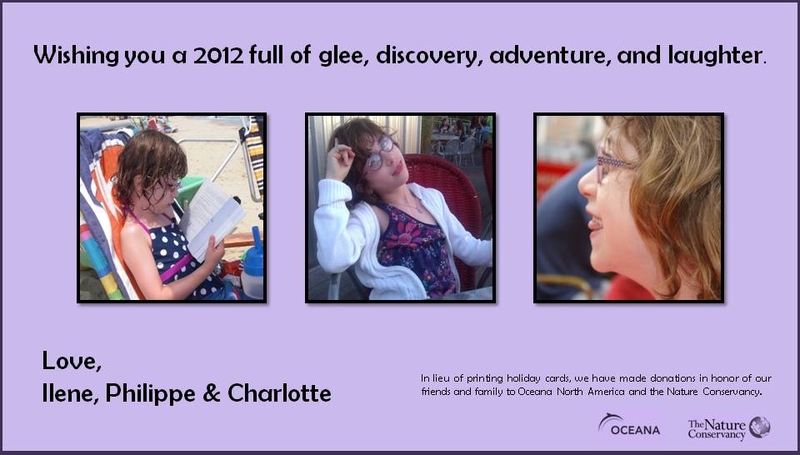 I think I finally relegated all the “year-end” review to Charlotte’s birthday post. After I took Charlotte to school yesterday, I began to reflect on all that she has done and how she has grown since last January. 2011 was an extraordinary calendar year for Charlotte, so I thought it worth recapping here (especially because I was a neglectful blogger in 2011!). On January 3, 2011, Charlotte started a new school. Uprooted from the only home she’d ever known, far from the friends and school she’d grown to love, she fearlessly walked into a classroom in Arlington, MA with a huge grin on her face. She never once complained, though a few times she did tell us how much she missed Chicago. After a few days she told us that her new school was a lot like her old one. The International School of Boston did have a kindergarten curriculum nearly identical to the Lycée Français. Charlotte observed that the work was the same, “but the kids are different, my teacher has brown hair and her assistant is a man.” And, just like that, she was right at home. In April, Charlotte went to her first Red Sox game. Thanks to our pal Pam, we have about 100 photos of this momentous occasion. She is now a proud member of Red Sox Nation and a huge fan. If it’s baseball, she’s in. We also went to our first Pawtucket Sox game (the quite local farm team). At $5 a ticket in a stadium so small you can hear the players feet hit the dirt, it’s worth the drive and I imagine we’ll be there often this season. I can think of no better “classroom” for all of us with regards the finer points of the game. We’ll rely on Hal, Brandi and my friend Pam to coach on home team specifics back in Beantown. In July we moved again, this time to Arlington to be closer to school. Charlotte left for camp from Brookline and returned to Arlington. She thought it all a big adventure, especially because Aunt Bobbie picked her up from the bus after camp, made french toast for dinner, and let her watch television while she ate. She’s still talking about it! In Arlington, Charlotte became fast friends with the children on our block, quickly learned to love the park and pond down the street, and got back into the groove of riding our bike to school. In August, Charlotte visited Nenenne in Belgium. Visiting Nenenne is a big deal because Charlotte only gets to see Philippe’s mother (and sister and aunts and uncle) once a year. This year it was an even bigger deal. Why? Because my mother joined us and Charlotte’s two grandmothers met for the first time. We may go to Belgium once a year, but this was a once in a lifetime trip. In September, Charlotte joined the big kids on the Cambridge campus of the International School of Boston, proudly beginning first grade. She literally ran into the first day of school. I’m thrilled to say that her enthusiasm has not waned. She springs out of the car each morning and in the afternoon tells me that she had a “really, really great day.” She’s learning so much and growing in ways that astound me. In April, November, and December, Charlotte spent some time in New York City. She has walked from Penn Station to 57th St at 6th Avenue (by way of the NY Public Library) and from Grand Central Station to Little Italy (also by way of the Library). Like us, she loves the Big Apple. Especially if it includes a ride on the carousel in Bryant Park and a visit to the children’s reading room at, you guessed it, the Library. She has met high school and college friends that I don’t see often enough and she loves the American Museum of Natural History. Charlotte also went to her first plays this year starting with The Lion King (okay, that was December 2010 in Chicago), several puppet shows at the Puppet Theater in Brookline, Peter Pan 360, Cirque de Soleil, and the Big Apple Circus. And she loved it all. When I have more time, I’ll tell you about the books we’ve read. For now, just know that there a certain boy wizard; four children and a godly Lion; Ramona; Ivy and Bean; and all of L. Frank Baum’s menagerie are all among her favorite people. Finally, last January, Charlotte’s English teacher, Jeanie Miller, asked the kids to write about their new year’s resolutions. Charlotte had one: to learn to swim. She’s been working really hard to learn. She finally puts her head all the way under water and can do some limited doggie paddling. She’ll be back in class at the Boys and Girls Club of Arlington at the end of this month and we hope to see a lot of improvement. Her big goal for this year is to learn to ride a bicycle without training wheels. And this morning she told me that she also wants to be a better listener and control her emotions better when she’s tired. Don’t we all?! Team Charlotte didn’t have much to do this year in terms of Charlotte’s health. But we did add to the roster. To our emeritus team in Chicago, I say, as always, thanks. And to Drs. Katie Mitchel and Dan Slater (my high school classmate), our new pediatricians; Dr. Lucy Arnold, our new cardiologist; Dr. M. Kazlas (opthomologist); and Dr. Katerina Rafa (dentist) as well as Isabelle, Aileen, Sophie and Leigh, Ms. Roselini, Ms. Hammond, Mohamed, and Karine, Charlotte’s teachers , I say Welcome and Bienvenue, Thanks so much and Merci.